The right equipment is necessary if one is to concealed carry, and two of the first items on the list are a decent holster and a good gun belt. Granted, inside the waistband (IWB) or outside the waistband (OWB) holster carry necessitate the belt more than other methods, but a gun belt is necessary if one is to carry that way. Since IWB and OWB holsters ride on or about the waistband, a gun belt is an absolute necessity. 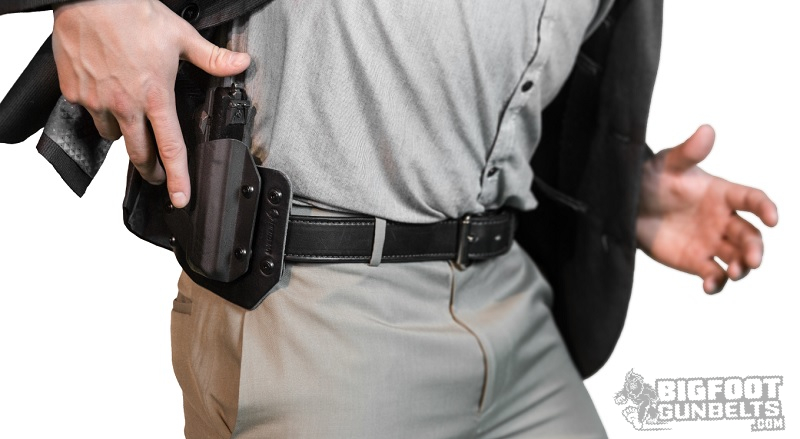 A secured OWB or IWB belt and holster will stay in place, and thus won't slip, sag or otherwise give away the presence of a concealed pistol with movement. Keeping any jostling from happening or at least keeping it to a minimum will also minimize the risk of anything like a gun coming free from it's holster from happening. A strong belt secures the holster better than a weak one, and a strongly secured holster means a more strongly secured pistol. This creates a better concealed carry experience. If you have cause to consciously worry about your belt, holster and firearm while carrying, you shouldn't be carrying with the equipment you have. A gun belt you never have to worry about is a good place to start. 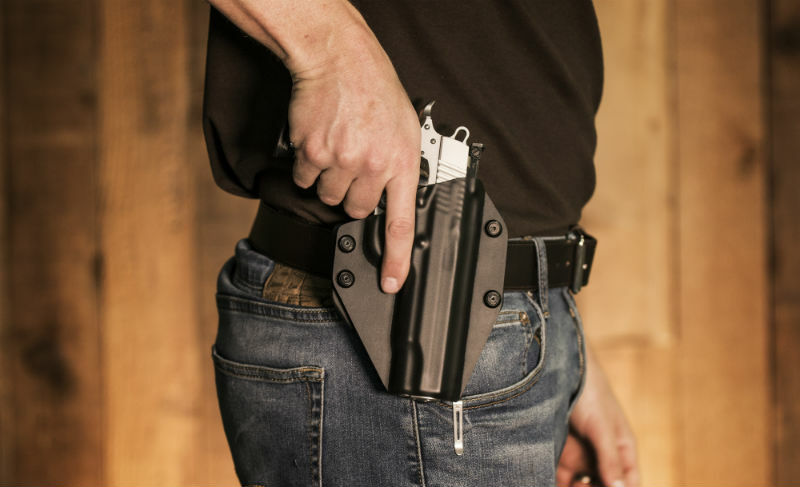 The reason behind getting a dedicated concealed carry belt over just any old belt is the additional vertical hold, or the amount of tension needed to keep one's pants, gun and holster from riding up or down. A good, stout belt will keep them in place. It's vital if a pistol is part of your every day carry" setup. A gun belt is thicker than a department store belt. The additional material increases the tension and isn't as easily moved. Once you put it on, it tends to stay there. Why does this matter? Simple - the more easily a holster and pistol are able to move, the more likely they will move to a position where they are more easily seen and that defeats the entire purpose of concealing. The idea is to have no one know that you have a pistol in the first place. There's an internet meme going around that quotes actor Clint Eastwood as saying that "if a gun is in a room, I want to control it" or something to that effect. Like most internet memes, it's apocryphal, but whether he actually said that or not is beside the point; the point is that a secure pistol is a safe pistol. A concealed carrier's first, second and last concern has to be gun safety. Nothing pleases gun control advocates more than something going wrong; it gives them something else they can point to as evidence that people can't be trusted with firearms. Furthermore, carelessness - with firearms, cars, kitchen appliances or anything at all - can put other people at risk for injury or worse. If a person accidentally causes a firearm to discharge and wounds somebody, they deserve every applicable criminal charge. They deserve to have their guns taken away. They deserve lawsuits, and because they were negligent and such a person shouldn't be trusted with guns or anything that has the same potential for damage. How, then do you carry safely? One makes it so the pistol doesn't travel once holstered. The easiest way for something bad to happen is for a pistol to fall out of it's holster. A concealed carry belt keeps that from happening, by securing the holster and therefore the firearm to the wearer. A dropped pistol can fall into the wrong hands. Some models can even discharge if dropped; a number of pistols have been recalled due to this issue; production has been stopped for issues of this kind. As a concealed carrier, you have a responsibility to your fellow citizens to be safe while carrying. Doing so with a secured pistol is paramount, as that keeps a pistol exactly where it's supposed to be - the kind of gun control that everyone can get behind.